Larry Levitt and Jeffrey Young both noted via Twitter that this is due to a margin of error thing (+/- 1.1 million according to Table 2 on Page 3 of the report), but this makes zero sense to me. If I'm understanding correctly, Rand didn't get that 3.9M number from the actual HHS enrollment data (the official number was 4.242M as of 3/01, and should have been right around 4.9M as of "Mid-March", the date noted in the RAND survey). They got it from their own survey results, which does make sense. So, my question is this: If all of the other results in their survey were based on survey results of 3.9M as of mid-March, does it therefore follow that the other results should be extrapolated proportionately from 3.9M to 4.9M, the actual number as of mid-March? In other words, if RAND came up with 36% out of 3.9M as being previously uninsured, it seems to me that I should simply extrapolate that same 36% out to 4.9M, for 1.76 million uninsured out of the first 4.9 million. Certainly I don't think anyone would suggest that it should be lower thatn 36% by that point, since everyone seems to agree that the percent of previously uninsrued has continuously increased over time. So, assuming I'm correct about this (and again, this is where I am definitely no Nate Silver! )...I think we've found our absolute floor on the percent of Exchange-based Individual QHP Enrollees who were Previously Uninsured: 36%. Of course, as the survey notes, this doesn't include any data from the late-March surge. Between March 17 - March 31st, an additional 2.2 million people enrolled in exchange QHPs. Nor does it include the (estimated) 320K who have enrolled since then, or the estimated 280K or so who I still expect to enroll by the 15th. If the grand total ends up around 7.7M, then even assuming that the late surge stayed at the 36% level (which I don't believe for a moment), that still would mean at least 2.8 million of the exchange QHPs are newly insured. 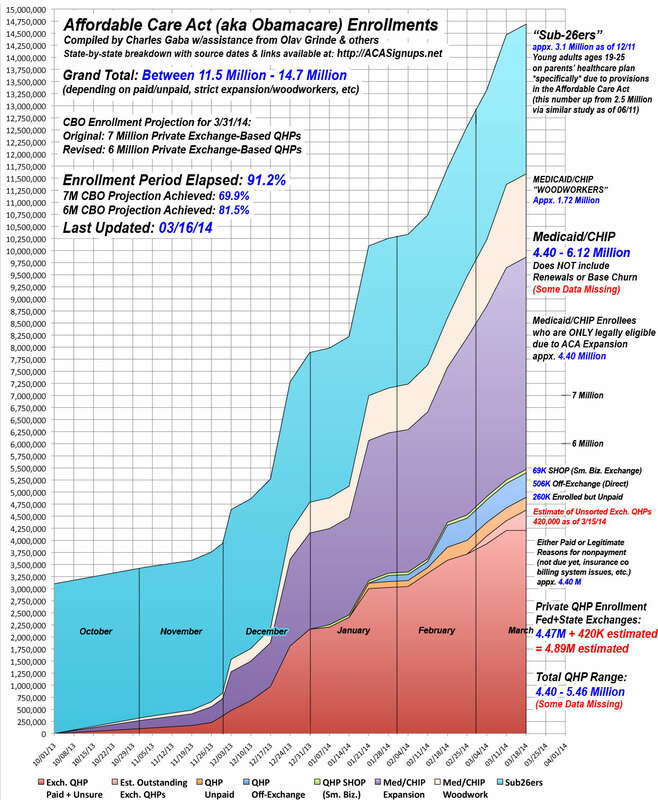 For my part, I'm pretty confident that a good 70% or more of the late-March/early-April enrollments are newly insured, which would make the overall total roughly 2 million higher (around 3.72M out of 7.7M, or roughly 48% of the total). In other words, around 50/50...which is what I've been figuring it would be since at least March 8th. @charles_gaba I think a reasonable extrapolation, keeping in mind that there are many different definitions of "previously uninsured."